Darryl is a seriously awesome guy who has the near mystical ability to get adults to act like kids. I've had the opportunity to attend several of his workouts and I'm completely blown away by his never ending energy, passion for fitness and superhuman strength. He isn't afraid to challenge the biggest and burliest CrossFitter to push him around, and I've yet to see him lose. The dude's got dance moves too! 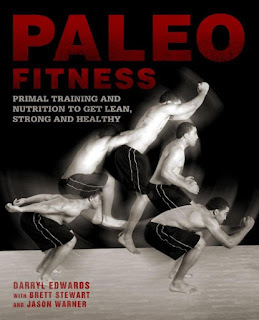 His book is a great resource for anyone who wants to take their Paleo lifestyle to a new level by adding interesting and intense exercise but its also straightforward enough for even for a Paleo newcomer to enjoy and appreciate. If you ever get a chance, you have to go to one of his in person workshops, but if you can't, Paleo Fitness is the next best thing! In Paleo Fitness, Darryl and his co-authors break down food myths, introduce you to the Paleo diet, and give a solid education on what constitutes real fitness. The book then outlines a step-by-step workout routine that will progress you through three months of workouts as well as Paleo recipes that you can use to fuel your workouts. Each exercise is described in detail and has clear pictures to help make sure you use proper form. The detailed program in Paleo Fitness is a real asset because, while it's well and good to say "walk a lot, do some heavy lifting, and sprint from time to time", unless you are already confident in your ability to exercise, you need some direction. I'd look at the exercise progression in Paleo Fitness the way you might look at a Whole 30. Follow the program to learn skills, techniques, and habits that you will then incorporate into your lifestyle. It's only three months, what do you have to lose? People go on and on about P90X, well this is PALEO 90X! Get it and get Paleo fit! A great review Tony, this is one excellent book! Great review of the book and video, thanks for this Tony!